Olympia Assembly started in March of 2017, amidst ecological and political catastrophe. 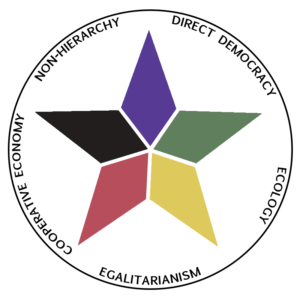 It was created as a communal assembly project, coalescing around points of unity such as direct democracy, non-hierarchy, ecology, mutual aid, and direct action. The goal of the organization is to build the new world in the shell of the old by creating the building blocks of a libertarian socialist dual power project. It seeks to meet people’s needs and decentralize power, leading to a crisis of legitimacy for the state where people powered institutions are posed against hierarchical structures. Olympia Assembly (OA) has launched a variety of collectives, mutual aid projects, direct actions, and educational projects in our city of 50,000 people. At our assemblies and general meetings, people deliberate and co-author decisions to be implemented by the group according to the principles of deliberation, direct democracy, and participatory relationships. We have embedded collectives and delegates that implement decisions within the limits of the policy made at the base of the general meetings. At meetings, people bring discussion topics and proposals to the table and we create a participatory agenda. When there are proposals, we deliberate, filter decisions through our points of unity, and then vote. During deliberation, people can bring forward questions, concerns, amendments, critiques, and dissent. This lets us round out decisions, and as a result, we almost always come to a unanimous or near-unanimous agreement – even during mass assemblies. When there is disagreement, we use simple majority decision making. We are working on fleshing out our bylaws. Olympia Assembly working groups are often ephemeral and geared towards a particular project – seasonal assemblies, mutual aid events, protests, or other periodic events – and then disappear. However, it has also created some ongoing projects such as the Olympia Solidarity Network, Mutual Aid Mondays, and Olympia Community Medics. Olympia Solidarity network, or OlySol, is an anti-capitalist direct action working group connected to Olympia Assembly. It has had four direct action victories since starting in the late summer of 2017. OlySol won back a tenant’s stolen deposit through a demand delivery and an office picket. We won back a worker’s stolen wages through a fifty-person demand delivery. Using direct action, we won repairs for over 100 tenants at a low-income housing complex. This involved flyering door to door at the apartment complex, meeting with tenants, picketing the management office, flyering against the local management company and at the houses and neighborhoods of the management in Seattle. OlySol just won a campaign against a private security firm hired by building owners to sweep houseless people out of alcoves at night. That campaign involved everything from flyering multiple cities, picketing outside of businesses, phone zaps, mass leafleting, bank shutdowns, and disruptions of the private security force. Mutual Aid Mondays is a weekly project that provides houseless camps in Olympia with free food, clothes, hygiene materials, tarps, tents, blankets, sleeping bags, coffee, first aid supplies, and literature. Emerging from an alliance between Olympia Assembly and four other organizations, Mutual Aid Mondays provide material assistance to those most in need and helps build relationships between radicals and the houseless population. Occupying public space, these camps provide houseless people with a place to stay –although not an ideal one – and are the vanguard against encroaching rent increases and real estate investment. Incubated at the 2018 Spring Assembly, Olympia Community Medics (OCM) is a medic collective for street protests and houseless people. OCM has helped with multiple marches, protests, and anti-fascist demonstrations as well as providing weekly medical supplies to houseless people around downtown. The collective works closely with Olympia Assembly, OlySol, and Mutual Aid Mondays. Olympia Assembly has also helped on several other actions and events. We have worked with Just Housing, a local houseless solidarity organization, on civil disobedience campaigns. Over twenty people from our first Assembly participated in a camp-in organized by Just Housing that broke the city’s unjust “no sitting/laying” ordinance. Throughout our first summer, we helped with weekly non-violent direct-action campaigns at city hall, providing people, promotion, and material support for the actions. We have also recently started working on creating a tenant’s assembly focused on the Eastside region of Olympia. Olympia Assembly has initiated other mutual aid events that provided free tools and food to people, especially houseless people, including a neighborhood block party with free food, music, clothes, and literature. We have also thrown benefit shows for Rojava that became among the biggest DIY parties of the year, distributing libertarian socialist literature, screening a documentary about Rojava, and raising money for Afrin. We also put on a benefit show to support Just Housing’s work. We held a community forum on gentrification and a new condominium complex being built downtown. We have handed out thousands of pamphlets throughout the city about libertarian socialism and related issues. We have used our networks to help with action projects throughout the city and beyond. OA helped the local IWW and DSA chapter put on a May Day event in 2018 that had over two hundred people. Our popular education reading group has read everything from Bookchin texts to Jackson Rising by Kali Akuno. In 2018, Oly Assembly helped organize people in the Pacific Northwest to attend the Institute for Social Ecology Summer Intensive in Poulsbo, Washington. Olympia Assembly and Solidarity Network members spoke at the Fearless Cities conference in New York and at a communist forum in Seattle that featured Kali Akuno from Cooperation Jackson. Olympia Assembly has helped inspire multiple other projects; our assembly model, solidarity network, and Rojava solidarity projects have been emulated in other cities. One of the most important aspects of Olympia Assembly has been training people in how to structure participatory and democratic meetings. People have also learned how to do promotion, relationship building, and implementing policy made by the base. Learning from our successes and failures, these organizational skills provide tools and insights that we can take into other projects and other organizations. Although there are limits to our organization and area that require improvement, we have done pretty well for an organization that is only a year and a half old. One fundamental issue with Communalist organizing is how to apply the general principles to particular contexts. Doing this in your city in 2018 will be distinct from applying such principles in Rojava in 2011 or Jackson Mississippi in 2016. Some important questions to ask when starting a Communalist project are: What forces are opposed to a Communalist project? What institutional and cultural infrastructure exists in your region that is sympathetic to it? What relationships do you and fellow organizers already have? How can we best apply these general principles to particular contexts? And how do we embed our daily work in a larger political strategy? In our own local work, Olympia Assembly has confronted a variety of challenges. One of the biggest was an initial organizational identity crisis. There were radically different visions for what Olympia Assembly ought to do – some people wanted OA to be a vague assembly project whereas other people wanted OA to reflect specific libertarian socialist principles. This was compounded by the fact that the organization grew too fast and launched too soon so that we were unable to appropriately use the first few assemblies to meaningfully reach out. Another hurdle was that OA did not have a stable meeting space for the first half year. As a result, we had to have meetings to plan the meetings, which led to logistical nightmares and a lack of stability. This made it more difficult to get involved in OA, especially if one didn’t have much time. We have had a consistent meeting space for the last year, but by not having stability during the first few months, we missed a crucial opportunity to grow our organization. But due to the identity crisis of the organization, we were in many ways not ready to grow. A slower approach to building organizational stability, including basic stuff like consistent times and locations for meetings, would have allowed us to be more effective. We have had outreach issues; we don’t have a working group to promote the monthly meetings, only for the seasonal assemblies. This has led to a lack of promotion and a lack of reaching out to people. A few people do promotions informally with little to no coordination. Reaching out to friend groups for meetings, making social media event pages, and sending emails to list-serves is essentially reaching inwards. Most of our outreach for monthly meetings comes from informal conversations. We desperately need an outreach committee between each monthly meeting if we want to meaningfully grow. We need to be doing consistent flyering and door-to-door work, as well as more face to face conversations with acquaintances and strangers to invite them in. At this point in the organization, we have enough of an organizational infrastructure to start that process in a more meaningful way than when we first began. We also have sustained direct action and mutual aid projects people can join that are already off the ground and rolling that new people can easily plug into. There are multiple left-leaning communities in Olympia that have been essentially neglected in our outreach. We haven’t made a meaningful effort to flyer in parts of the city we don’t frequent and don’t do enough door-to-door work. There are groups with relatively similar politics to us, yet which operate in different social groups and do not work with us on shared ideals – such as some anarchist groups, some left groups, Quakers, and Unitarians. We have made some basic mistakes regarding bread and butter organizing methods. A related issue concerns inclusion versus political coherence, and the relationship of general assemblies and revolutionary political organizations. Although Olympia Assembly has reached out beyond the revolutionary left, including apolitical people and left-liberals, it remains an organization that mainly speaks to people who already share our politics. On the one hand, this is not surprising given that we have specific points of unity that spell out a broadly libertarian socialist orientation. While clearly stating our politics and vision, it also limits its appeal. By running the group according to explicitly libertarian socialist principles rather than simply as a democratic assembly model, we have essentially created a libertarian socialist organization. This is distinct from calling for general assemblies of community members regardless of political orientation. Yet part of the strategy of Communalism is to use general community assemblies to propagate libertarian socialist content and by extension reach out to people and get popular assemblies to endorse and embody such principles. OA functions as an assembly based on shared points of political unity, but we have failed to operate as a forum for dialogue that reaches far beyond our general political milieu. The seasonal assemblies come closest to this goal, but outreach is still limited. OA needs to find other ways to engage with people who are not already sympathetic to libertarian socialist principles. Yet people don’t have to be libertarian socialists to join OA; it is possible to agree to such principles within the organization while disagreeing with libertarian socialism as a broader social goal. Some liberals, Marxist-Leninists, and anarchists have worked very well within OA. Our actual work and functional structure can also function as outreach; it has engaged some people who weren’t initially sympathetic to libertarian socialist ideas. In part, our points of unity exist because while direct democracy is necessary, alone it is not sufficient. It must be rounded out by the political content of freedom and non-hierarchy, clearly enshrined in the organization’s points of unity and bylaws. Without a coherent ethical content and structure, it is possible to use democratic forms to vote on profoundly undemocratic and unfree measures. We need to find a way for our organization to maintain principled politics while also reaching out to new people. This can be done by creating more ideologically neutral spaces and assemblies where dialogue can happen between people who disagree. We can also host more issue-specific forums on vital community topics. We can also engage existing neighborhood associations, some of which have interesting projects, including an organic community garden and a campaign to stop a 7-11 store. This could be done through organizing around a variety of issues based in common conditions that move towards building common political ideals. As housing is one such arena, we are currently organizing a tenant’s assembly. The more politically specific an organization is, the more exclusive it can be to people who do not yet agree with those politics. However, a democratic structure, ethics, and strategy can be attractive to radicals and non-radicals alike. It is ultimately difficult to navigate exactly how loose versus politically specific a particular Communalist project should be. Demographics is another important factor; Olympia is a college town, and the people who started Olympia Assembly were mainly students between the ages of 18 and 30. Regardless of how hard we have tried to reach out beyond the student population, we remain much too youth- and student-centric. This is reflected among the founders of OA, who have most or many of their acquaintances, friends, and comrades in the student population. Even though the expressed goal of OA is to reach out to the Olympia community as a whole, it can easily look like a student-centric organization because of the composition of the group. We have made some progress in reaching beyond the student population, but it still haunts the organization and limits our capacity to reach out. The student population is disproportionately radical and have far more time on their hands compared to others. They are also disproportionately transient and subcultural. This could pose serious issues for OA over time. Given this population, many core members of OA share the same social circle. This creates an issue where a large clique appears to have, and in fact does have, too much informal power over the organization. This inhibits the kind of comradeship that goes beyond friendship that organizations need. People who are not friends with core OA organizers can feel isolated and left out, even if they are welcomed with open arms into the organization. Although comrades might also be friends, we need to be conscious of these elements and how they can inhibit solidarity with strangers, even though friendship can also fuel momentum and outreach. Clearly, political projects must go beyond specific populations and friend groups if they are to become mass movements. These previous concerns contribute to the problem of inconsistent membership. Our membership has been semi-consistent, but not stable enough. Our monthly meetings often have at least 10 regular members showing up, some semi-regular members, as well as a few new people at each meeting. Their capacity and willingness to engage varies due to factors like work, school, commitment to the project, and hope in the potential of Olympia Assembly. Thus, we have a few dozen consistent members alongside a large but inconsistent network of about 200+ people. It is often difficult to get new people to take ownership of OA. New members often do not fully understand the principles and goals of OA, how to participate in meetings, or organize outside of meetings – all of which have a learning curve. Founding members often take skills they have learned for granted, and there is not enough orientation for new members about how to get involved. Without theoretical and practical knowledge about how OA meetings function over time, people do not see the reason or to participate. Furthermore, new people don’t always see the fruits of individual meetings or actions, as they almost never appear instantly. It is in large part through sustained meetings, and the legwork in between, that organizational gains become evident. This situation is exacerbated by unfinished organizational bylaws. We have fragments – a skeleton of a decision-making process, some delegated roles and limits on them – but without a guide to how the organization is supposed to function, it is difficult for new people to fully comprehend what we are doing. Bylaws summarize our aims and structure and will allow the organization to be accountable to them. Together, these dynamics result in a situation where the most vocal and committed members end up making most of the proposals. This exacerbates the lack of participation from less consistent and committed members. The issue of different levels of experience and engagement in an organization is inevitable, but increased participation and group ownership are desirable for both ethical and strategic reasons. One step towards rectifying this problem was the creation of an education committee. Lastly, it has been noted that although the work that OlySol does is important and enjoyable, at times OA is perceived as too focused on the “more fun” components of militant direct action rather the “less fun” work of collective building. While the intense focus on direct action campaigns against bosses and landlords has been both warranted and successful, at times it has been over-emphasized at the expense of goals that reach beyond people already convinced of our ideals. This dynamic sometimes pits short-term goals against long-term goals instead of meshing them together. To conclude, Olympia Assembly offers a democratic and non-hierarchical vision of the good society that is linked to a strategic orientation of building Communalist forms of dual power. At times we act as if this is shared common sense. Yet without spreading knowledge of our ethical and strategic vision, our aims can become obscure or invite skepticism. Although it can be simplified, Communalist praxis can be difficult to explain or understand, especially in the current political context. Questions like “What ought to be politically?” and “How ought we get there?” are complex and require complex answers. We need to find educational tools that express the basic substance of Communalism in a way that is easy to understand without distorting its core ethos. Making concrete gains now while keeping the bigger picture in mind is a tall order for any group. This process will require a lot of experimentation, but there are also many historical experiments for us to learn from. We do not need to completely reinvent the wheel. We can sift through history to help develop a praxis that learns from the past as well as incorporating new insights. We must constantly adapt our strategy to our political vision, adapt our political vision to ethical means, and adapt all of the above to new relevant conditions to find out what kind of proposals ought to be decided on to get us from here to utopia.